A few minutes ago Raghu was watching a video with me online, where we saw images of the soup lines during the Great Depression. He immediately connected it to what he read about Al Capone in the Horrible Histories Book. I learnt from him that during the Great Depression Al Capone tried to buy his way into the heart of the public, during his court trial, by setting up Soup Lines for the unemployed. Often such moments happen during my randomly busy days and I’m unable to remember the connections made or the moment passes and the next time i’m at the computer my mind draws a blank. today per chance the video froze and so i decided to blog this right away. I also found it amazing that for a boy who normally does not read novel-length and novel-typesize books, Raghu read the Horrible Histories book on Al Capone cover to cover. It amazes me the information that he squirrels away. I may never truly know what my child has learnt, where he learnt it, why he learnt it, how he learnt it and when he learnt it. But I know that he will learn what he needs, when he needs it, etc. You get my drift. As Raghu plays around the house he might hear us conversing about a topic and he jumps right in with his connections, information or sometimes a joke he heard about the topic. This is something Ravi and I now welcome. Sometimes it feels like our conversations are interrupted too often and we might tell Raghu to hold his thought while we complete our train of thought… but mostly its a joy to have him and these days even Zoya jumping right in and giving us their world view. They can influence the actions in this house and have impact. I think for a child this is real-time learning. Zoya has been parading us with dialogs from a diverse variety of movies. She will say something from 3 idiots “jahanpana tussi great ho” when I bring her something she likes 🙂 Or she might put her lyrics to the tune of “Return to Sender” (Elvis). Try singing this to the tune: “Nana (Ravi) is verrrry grumpy, and not being nice, so I said to the postman, his letter comes back, Return to Sender, address unknown”. Its so funny! And the song has the desired effect and Nana is less grumpy right away. She makes up songs like this in tune to many Hindi and English songs. Sometimes nonsensical, sometimes circumstances will be reflected in the lyrics 🙂 We all enjoy her way of communicating.. thru her songs. She tells us how she feels, what she wants and even asks questions. Raghu has been helping her with holding the tune and finding the right rhyming word. My children and I are learning way more than just facts and figures. We learn about emotions, personalities, the world and why it is the way it is (a topic that is rehashed every few weeks as my ability to talk about it improves and my children ask more complex things), our selves, our family and its dynamics, what is money and why some people want more of it and some don’t. Etcetera. And if I’m sad and they notice it, we talk about it. Sharing my emotions, sharing how I dealt with an emotional moment, is important to me. Often Raghu will know exactly what I need or want and will make wise suggestions… go for a walk Amma or he might ask if I want a glass of water. Raghu advised me recently, “You know Amma, when you get angry and you want to not be angry any more, then you just need to forget what happened.” Ravi and I rarely, these days, get truly annoyed with each other.. its usually circumstantial stuff, rocky centers due to a cold or some such…. and yet… this piece of advice from my 9 year old was in alignment with what I have been learning from reading Byron Katie. I was indeed grumpy with Ravi that day and my grumpiness vanished. And I continue to learn. I returned around 11 pm last night from a day-trip to Mumbai. Kids and Ravi were waiting up. As i settled in, caught up on the day’s news and Ravi filled me in on stuff, i noticed that Moley, our 4 year old goldfish, was looking funny. He was floppy and floating funny. Not good. Raghu and Zoya had named each of our 5 goldfish who entered our lives around 3 years ago, courtesy of a friend who had had them for a year. Raghu has fed them every day for over 2 years. Raghu was looking miserable. I suggested we move some rocks around inside the aquarium and make him comfortable. Raghu started to cry. I was focusing completely on Raghu now. How could i help him? For a while i stayed quiet. Held his hand. 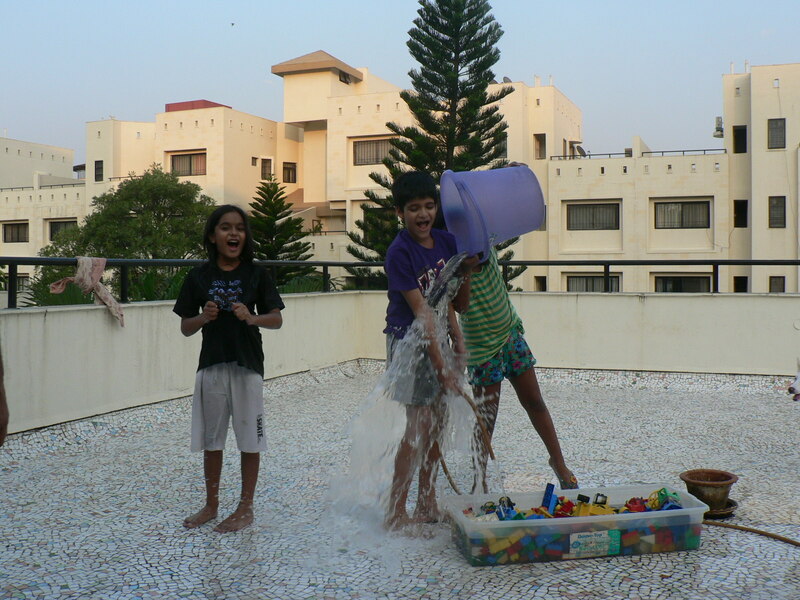 Raghu was standing on top of an old toy chest to watch Mole at close quarters. We have kept our aquarium on a high shelf. Perfect for viewing but not if the kids want to dip their hands inside. Raghu stood on the chest and dipped his hands in and stroked the little fish. 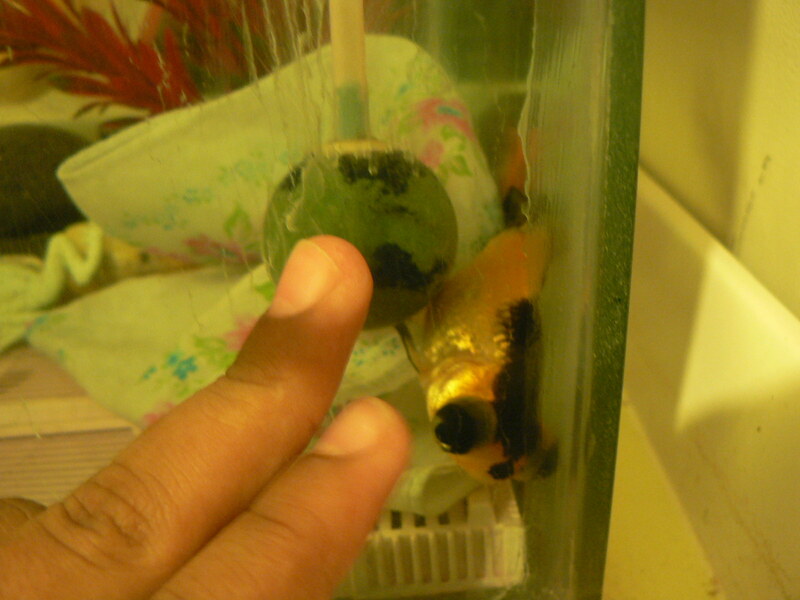 At this point I knew this fish was dying and it did not matter what Raghu did. As the minutes ticked by I felt inspired to say things in a soft voice to Raghu and see how he reacted. I asked if he would like me to take some last photos of Mole. He said yes. One is below. Then he stated crying again. I started talking to Mole. I told him that we were grateful to have had him be with us for such a long time. That we would miss him but knew that he needed to go. I wished him well and said i was willing to let him go. Raghu was quiet and listening. I then offered to read The Mountains of Tibet by Mordicai Gerstein. Raghu said yes. A beautifully illustrated book of living and dying and rebirth that brings me much peace. Then I asked Raghu if he knew why he was crying.. was it because he, Raghu, would miss the fish? Was it because he felt that the fish did not want to die? Raghu seemed still and said yes, he was not ready to let him go and yes, he was not sure that the fish wanted to go either. So i said i too am fearful. Of what, Raghu asked. I am fearful of my parents dying and me missing them. Raghu looked at me and we then spent many minutes talking about death, dying, needing to move on from this particular life, etc. My theory is that if this life does not meet my needs, i will move on. And if i were to watch my parents dying, i’d like to tell them to go in peace. Not with me crying and them upset to see me upset. Reading Sogyal Rinpoche’s Tibetan Book of Living and Dying made me aware of the beauty of death. Then Raghu and I saw the irony… we celebrate births and do the opposite at death. Yet when a child is born, it is born to die. Raghu’s words. I was moved and yet very silent inside. Something of this conversation made us both very calm and no longer afraid. I asked him if he’d like me to talk to Mole some more and make him comfortable. So we lowered a soft kerchief into the tank, placed Mole’s still faintly living body onto it. Then i put on buddhist chants. And i said some Sanskrit chants. And i spoke to Mole and wished him well. Telling him to go in peace. Eventually Raghu fell asleep on a chair watching Mole in the tank. The next morning Raghu, Zoya, Ravi and I wrapped up Mole’s body in the kerchief and buried him in a pot of mud that has some lilly bulbs in it. We all stood around in silence for a minute. I watched Raghu carefully. He had moved on. HIs heart seemed to be quiet and full but peaceful. 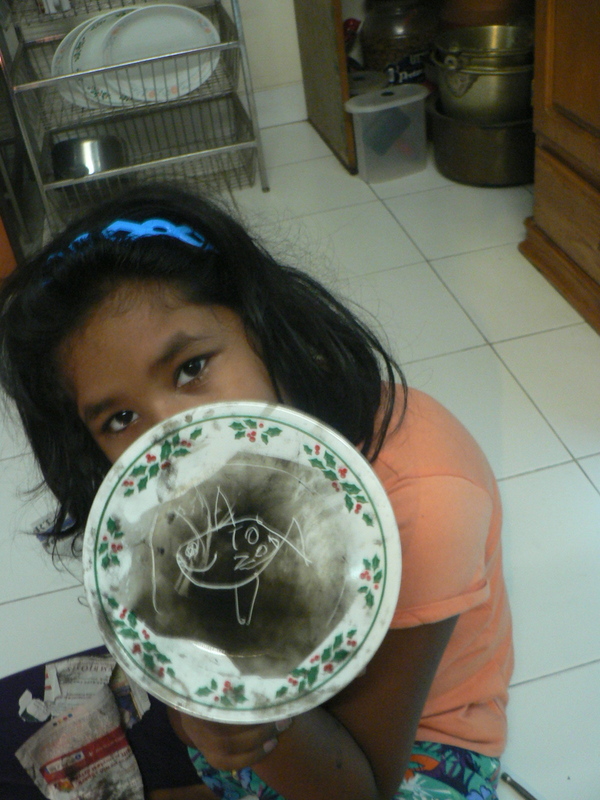 Zoya asked me where did the fish go when it died. So I said that I believe that the body went back to the earth (she understands that things decompose and become earth again) and that the energy went back to energy. This is the simplest thing i can say about death to Zoya. And i think it met with approval. For now. It was a moving experience for me and made me aware, in a very good way, of my own mortality.